« Corks and Canvases with Susan! 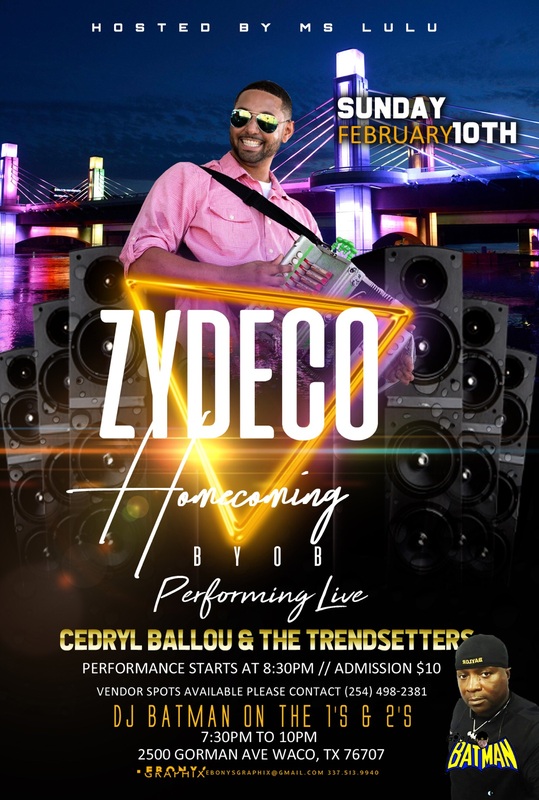 Bringing back that Zydeco sound to Central Texas wit Back 2Basics presenting Cedryl Ballou and the Trendsetters here in Waco Texas on February 10th at the El Pablo Event Hall. So bring out your dancing Zydeco partners and listen to some zydeco music with Waco’s own native Cedryl Ballou and TrendSetters bringing home that Zydeco sound. Doors open at 7:30 performance begins at 8:30 pm with DJ Batman from 94.5 The Beat on the ones in the two. LES GEAUX on here in Waco Texas.